A return to form from the maestro who brought us The Sixth Sense? Or another dud to add the ever-growing backlog from that guy who gave us The Happening? BUT one thing can be agreed, James McAvoy was excellent. Three girls are kidnapped by a man diagnosed with 23 distinct personalities. They must escape before the apparent emergence of a frightful new 24th. 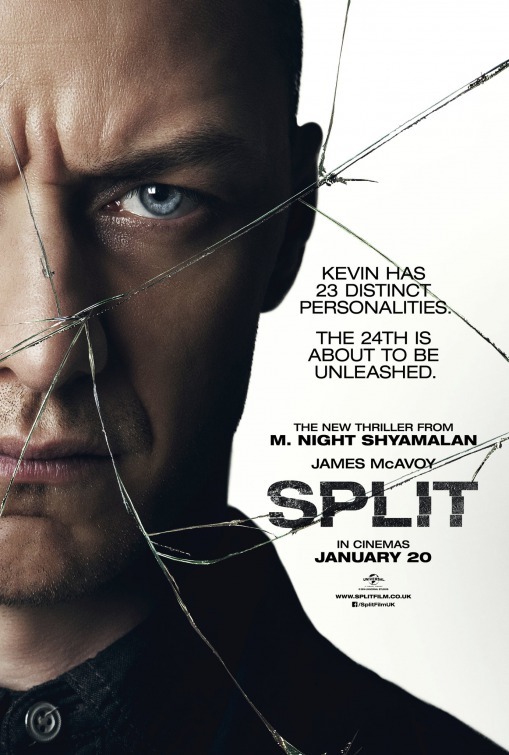 I think it’s fair to say that M. Night Shyamalan’s movie have . . . split audiences. Ba-dum-tssh. I read that somewhere and had to put it. I’ve always loved the premises BUT his execution? Well . . .
His big “twists” and mad endings have failed to impress of late; The Visit (Laughable), After Earth (Jaden Smith, say no more! ), The Lady in the Water (Apart from that breaking of the 4th wall moment, woeful) and The Happening . . .
What do you mean, where’s Signs and The Village? I *shuffles collar* actually enjoyed those movies. Yes, I know. Aliens attack Earth and their sole weakness is water. I know! BUT Mel Gibson and Johnny Cash, man! I digress. I was actually excited by all the trailers to see Shyamalan’s latest thriller and I didn’t mind it. It was alright BUT it just didn’t quite live up to my expectations. The opening didn’t mess about. An air of unease established straight from the get go as McAvoy’s “Dennis” made his introduction to the unsuspecting trio. Funny that I was praising Anya Taylor-Joy in another mediocre movie (Morgan). She played the withdrawn but resourceful Casey well. I didn’t expect to see Grace from Skins (Jessica Sula) in the troubled party either. Their initial captivity felt like something from Kiss the Girls with a hint of Misery. The first half hour set a slow burning atmospheric thriller with all sorts of questions flying around. Every time I could feel my patience wading, McAvoy’s Dennis would introduce another personality. McAvoy continues to impress yet again. I don’t think I would have been half as interested if he wasn’t at the helm. He stole the show with everybody else playing second fiddle. And that was part of the problem, every time the action was taken away from him, I lost interest. Betty Buckley (Carrie) didn’t do a bad turn as Dr Fletcher, the therapist desperate to help the troubled mad man. Fighting for “their” cause. Playing a very dangerous game. There were genuine moments where I felt tense. Especially when she worked out that she wasn’t talking to the “right person”. The girls played their parts well and were quite resilient. I expected more cliched horror movie gaffs with three teenage girls at the centre of the chaos BUT they were fairly strong characters. Not bad, Mr Shyamalan. BUT one thing that bugged me the most was the film’s actual premise. 23 personalities? All those trailers, billboards, posters. 23 personalities. Did we actually get 23 personalities? For the majority of the film, we only had 4. Great performance from Professor X but a measly number that increased to maybe 7 by the end? Come on now. It was great how with a twitch in the face and a burrow of the brow; McAvoy’s infantile nine year old Hedwig could transform into the meticulous and obsessive compulsive Dennis. His Patricia could easily have bordered on a parody of Mrs Doubtfire. BUT this could have been done in 90 minutes and been better for it. The pacing hammered the piece for me and the final act dragged. There was so many meandering flashbacks into Casey’s past, I kept wondering what the relevance of them were? They killed the tension and annoyed the hell out of me. All the talk of a Beast. This new and vicious 24th personality. Those crazy descriptions and the big reveal, the “What a twist” moment didn’t quite deliver. It was certainly creepy and unsettling with Shyamalan teasing the die hards BUT it didn’t quite pan out the way I hoped. Different. Watchable. BUT thriller of the year? Meh. Certainly worth a view for one stellar performance from the super Scot. A return of sorts. Not his best. BUT certainly NOT his worst by a country mile. I would recommend that you see absolutely anything else. And that’s coming from a Python fan! On paper, Pegg and the Pythons spelled perfection. Pull the other one! 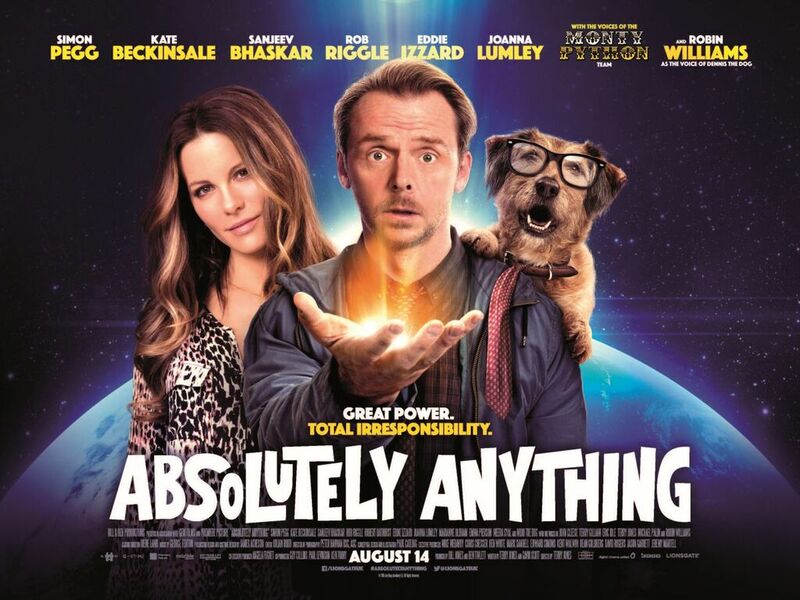 A group of eccentric aliens confer a human being (Simon Pegg) with the power to do absolutely anything as an experiment. After watching the Monty Python reunion at the O2 arena, I was a little anxious about their latest offering. The old gags felt stale and the gang just didn’t deliver for me. I understand that they couldn’t reach that level of energy and eccentricity (Come on, they’re in their seventies) BUT at least they used to be funny. Tragically that rut has continued. The premise was pretty much a British take on Bruce Almighty. BUT even that fell short by comparison. The flat opening really didn’t get things going. The Pythons provided their voicing gravitas to the aliens. It was silly enough but far too tame as they translated their alien names into female ones and bickered about destroying Planet Earth. Pegg certainly carried this lead balloon as much as he could and was a likeable lead. Once he got his powers, things really got into the flow. Shame that the momentum couldn’t stick. BUT I was entertained for a good twenty minutes. Pegg’s bathroom body enhancements had me howling. Hang on. Let me rephrase that. The fact he asks for the body of a great man and turns into Albert Einstein delivered the silly chuckle. And a gag involving the changing of one’s appendage was unexpected but dropped a cracking punch line. All the little jokes from the dog mess cleaning itself up to Pegg’s mate getting his own cult, ticked the boxes but it just wasn’t enough. Maybe I expected too much after growing up with the Python movies and TV shows. The Holy Grail and Life of Brian were iconic comedy classics. BUT this? Dreadful. The rest of the gags and set pieces were ridiculous, corny and stupid for all the wrong reasons. The stunning Kate Beckinsale did her best with her role but the love subplot with Pegg was too bland and nauseating to care about. Sanjeev Bhaskar didn’t do a bad job as Pegg’s best friend and tried to keep things watchable. Joanna Lumley was terrible in her cameo. You know you’re onto a loser when Ab Fab’s Patsy can’t save the day. The idea of a book critic grilling authors for scandal and ratings over intellect and culture may have sounded good on paper (In fact it doesn’t). BUT the finished result certainly wasn’t and by the end you wondered why her character was even involved. There was a saving grace with the late but always great Robin Williams as Dennis the dog. He was hilarious. Meshing all sorts of crazy voices including a spot of the old Doubtfire. The canine’s obsession with biscuits and running commentary on any passing thought that popped in his head delivered the much needed laughs. Eddie Izzard wasn’t in this enough as the Headmaster. He delivered with the tiny tidbits he was given. While Rob Riggle, on the other hand, was in it far too much. Normally you could bank on the chap to deliver the goods after his appearances in Step Brothers and Let’s Be Cops. But this time around, he was irritating and highly unfunny. It didn’t help that the divide between the Pythons and Eric Idle was so obvious. Even as an alien, Idle was separate from the team. Whether it was meant to be a joke in itself baffled me. He even had his own skit as a racist skeleton. You read that right. I don’t know if I made that sound better or worse. The tone was all over the place. It was macabre in one sequence. A joke about Pegg’s classroom blowing up certainly delivered the shock factor with a surprise asteroid attack. BUT in the next frame, we had people running around London with webbed feet and big fluffy ears. It felt like the gang suddenly realised that the film was supposed to be a 12A and watered it down. Killing off the last 30 minutes. The last 30 minutes of an 86 minute film. I knew it was always going to fall short of the iconic Life of Brian and Holy Grail BUT I expected so much more. For good portions of the film, I was bored or cringing at how dire the gags really were. Disappointed would be an overstatement. Pegg and the cast do their best and there were some laughs to be had BUT it was all for nothing. One star for the cast and one for the jokes that did tickle me.